Have you ever dreamed of hiking to the base of the world’s most iconic mountain? The plan: Undertake a once in a lifetime trek to the base of the world’s highest mountain, Everest. You have the right gear and clothing; insider knowledge on what to expect each day along the trail; are confident in managing altitude sickness , hiring a porter, staying in a tea house and ordering meals. You are prepared with insider advice and knowledge from a seasoned professional that make your precious adventure hassle free. The reality: Being part of an expensive organised tour, with people you prefer not to spend time with as you are herded with the rest of the crowd up towards Base Camp. You are not happy with your gear and clothing, you feel ripped off as you meet independent trekkers enjoying their own adventure and wish you had done it solo. What if you could get information from someone who had spent 6 years in the Himalaya, someone who has professionally led 20 mountain climbing and trekking expeditions in the Everest Region? Someone who’s advice is truly independent, not just touting so you join their tour. Advice that saves you hours of planning and research time, ensures you are properly prepared, shares a huge amount of tips and tricks to make the trek to Everest Base Camp and your time in Kathmandu and Nepal hassle free and safe. Remember To Breathe is an eBook designed to give you the skill and inspiration to tackle the hike to Everest Base Camp in Nepal. Created by an experienced mountaineer, it is packed with tips and ideas to make bookings, preparation, planning, gear selection and packing. It includes a comprehensive guide to frequently asked questions, the best time of the year to go, your health and required first aid supplies, training to get prepared for the trek, equipment you’ll need and where to find it, and comprehensive track notes. This 70 plus page downloadable PDF eBook is written with the first time visitor to Nepal in mind. It is packed with inside knowledge and tips to help you plan and execute your trip. Best still – as it is a downloadable eBook you can have it today (with no need for delivery fees) It’s just $A9.99. I think it’s a great read. As someone with minimal knowledge of the area I found it very helpful in its relaxed style and concise information, particularly the ‘survival tips’ in Chapter 8. I liked the first dot point – get to the front of the queue! This and other first-hand knowledge (like the beggars) comes across as someone familiar and respectful and realistic about the place. It’s much better than the romanticised blurbs on a few of the trekking websites. Why are we so proud of this eBook and believe it is a must read for anyone who is planning on trekking to Everest Base Camp or visiting Nepal? Because it’s practical – It is written by an experienced mountain guide, with an understanding of the Everest Region. With many years of experience in Nepal, Jay Reilly has an innate understanding where to go and what to see in Kathmandu and in the Khumbu Valley. He learnt the hard way how to organise trips to Nepal and get on the Track quickly and simply. He shows you how to juggle flights, book porters, and getting safely to the start and home at the end. There is a full packing list of what to take or leave at home. Because it’s for everyone – Designed to help out first timers, this guide is the most comprehensive resource for anyone who plans to trek to Everest Base Camp. It is simple, concise and included a lot of tips and tricks to make your trip fun and easy. Because it’s accessible – beautifully designed, easy to read and available for immediate download as a PDF today. I have started browsing through the book. I must say I am very impressed. The quality of the information is great and all easy to read. I think this will do very well as a guide for people heading to Base camp. Thanks for the opportunity to have a look. Want to check out a sample of the book? We recently interviewed the author Jay Reilly. This video explains why he wrote the book and what it contains to help you decide whether to trek to Everest Base camp independently or on a guided trip. 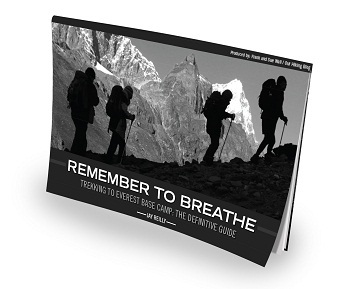 Remember To Breathe – Trekking to Everest Base Camp: The Definitive Guide guide is several chapters all packaged into one easy to read PDF. I liked his suggestions of getting in on the talks at the altitude hospital and talking with climbers at base camps. I guess people may hear about these once they’re on the trail, but by learning about them before going it helps to broaden the awareness and expectations of what might be part of the experience. It’s given me some very helpful insights and guidance for more questions I will ask the guiding company. I think the most important lesson is the fundamental issue of cardio-vascular fitness, which the title encapsulates. I’ll be doing as much as I can to get as fit as I can. Advice and tips – he shares his experience from on the trail. Jay Reilly started visiting the Khumbu Valley in 2002 as a commercial mountain climbing guide. Since then he has lead around 20 mountain climbing and trekking expeditions in the Everest Region. During his guiding exploits, Jay spent most of his time in the Khumbu Valley and has an intricate knowledge of its moods, politics and people. Jay is somewhat of a Nepal expert, having dealt with storms, injuries and illness, both altitude and otherwise – as well as having a good understanding of the way Nepalese bureaucracy works. Apart from being in the Khumbu region, Jay spent time hanging out in Kathmandu between mountain climbing expeditions. His knowledge of the city and his ability to get off the tourist trail make him a sought after leader and guide.